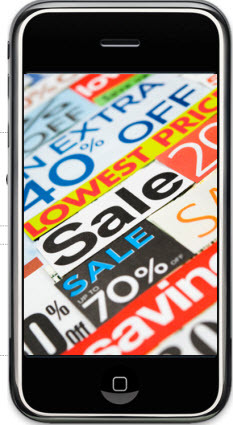 Mobile couponing is one of the “hot” areas in mobile commerce today. Mobile couponing is “the fastest growing and most obvious mobile marketing application” according to Borell Associates, with mobile coupon spending expected to grow at a rapid cumulative average growth rate (CAGR) of nearly 78%. A recent study by Gartneralso showed that mobile couponing was one of the top activities consumers who use mobile devices for shopping planned on doing. Make mobile coupons available on your mobile website- Okay, this doesn’t seem all that radical (and it’s not), but many retailers who have a mobile strategy and offer mobile coupons, only do so as part of their native application and not part of their mobile website. The reason why you’ll want to do so is that you’ll reach a wider audience with the mobile web, particularly as a richer experience evolves on smartphones. Also, many retailers today already offer coupons through their traditional website, extending coupons to the mobile web is a no-brainer. Create mobile coupons that are store specific– As mobile websites and native apps are able to use the mobile devices GPS device, being able to deliver location or store specific coupons to the mobile consumer will become a reality. The benefits are enormous: not only will the shopper be able to understand what deals they can find in that particular store, but retailers will be able to promote and sell excess inventory in a particular store, increasing effective inventory management. Personalize mobile coupons– Making coupons relevant to the preferences, time and location will help not only personalize coupons, but make them more likely to convert customers. For instance, target coupons based on past purchasing behavior or selected preferences for when consumers sign up for coupon alerts. A consumer who likes men’s clothing would rather only receive coupons for those products, as opposed to women’s clothing that he wouldn’t be interested in. Allow for consumer opt-in alerts other than SMS. Today, most mobile coupons are issued via SMS. Provide alternative mechanisms for notifications, such as email or RSS. Let consumers opt-in for notifications that work best for them. Integrate coupons into the core mobile shopping experience– Make mobile coupons and offers an integral part of the consumer mobile experience. Allowing consumers to browse what coupons are available are a great place to start, but tying them to part of the overall mobile shopping experience will maximize effectiveness. For instance, when a consumer scans a barcode on a product in-store, searches a product, browses to a product page, or undertakes another activity on the mobile storefront, serve up relevant coupons tied to the product they are looking for. Provide coupons through location-based services– Location-based services (LBS) offer a huge opportunity for retailers, particularly when mobile coupons and offers are tied to the experience. While consumer adoption of LBS is still low (about 4% according to a November 2010 study by the Pew Internet & American Life project), the consumers who are bothering to check into your location are invested consumers, or in other words they really want to do business with you (otherwise, why bother checking in?). The Gap has done a great job tapping this opportunity by tying offers to Foursquare check-ins, and Starbucks has done the same for mayorships. As LBS evolve beyond check-ins and mayorship rewards, and allows for quality of experience to highlight best places to shop (among other new capabilities), additional opportunities will arise for coupons and offers through LBS. Offer coupons through other channels- One of the major challenges for consumer use of coupons is actually finding coupons. Making them available through your mobile website and/or native app is a great place to start, but shouldn’t limited there. Distribute them through social media—Twitter, Facebook, through blogging efforts, etc., but also through coupon aggregators, such as Yowza, 8Coupons, Zavers, Coupon Sherpa, and Cellfire. Find the one that makes sense for your brand, and increase the reach. These are a few ideas on how to approach mobile couponing differently to succeed. What other ideas do you have? Great article Gary! The biggest hurdle I see is stores actually accepting them off your phone- it’s a shift in thinking, but I think those that do will see sales soar!